Arrival, approach, invitation, incitement. A visit that brings unexpected fortune. It's interesting that my digital Tarot deck should spit out this card for me today, considering the arrival on Saturday of the highly-anticipated first league goal by our dreamy French striker, Parcival. I mean, Giroud. Arsenal beat West Ham 3-1: Giroud, Walcott and Carzola all contributed classy and important goals – as covered here. But for this Gunner – (that's me, by the way) – the day belonged to Olivier and so I'm glad that the Knight Of Cups was the 37th card of the seventh shuffle of my deck, and therefore today's blog's focus. Because when I think about Knights, I think about King Arthur, Camelot and the Holy Grail. (And Monty Python, of course – but that's a completely different blog: one that uses coconuts.) 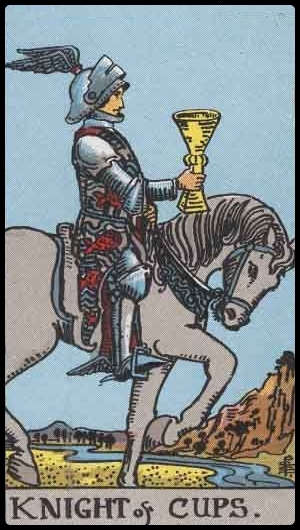 And coincidentally, the Knight of Cups in Tarot is often compared to Parcival, the true Grail Knight, and the holiest of King Arthur's Knights of the Round Table. Parcival was raised deep in Wasteland Forest by his mother – who tried her best to shield him from the silly knight activities that were so popular in Ye Olden Dayes, and that had claimed the lives of his father and two brothers. Sorry to interrupt the story so soon, but that's just silly. Trying to stop your son from becoming a knight by hiding him in a forest is about as useful as hiding drugs from your kids in order to stop them from becoming junkies. After all: we desire most what we cannot have. Sure – leaving packets of cocaine or heroine lying around may seem a tad irresponsible, but I reckon as long as you don't make a big deal of them, you should be OK. Also, bear in mind that most drugs require a lot of preparation and aren't cheap. Kids these days expect everything on demand. For free. They can't even make their own sandwiches. Oh – and how're you supposed to cook down your smack if you aren't allowed playing with fire..?! Olly wasn't allowed to watch TV, unless it was the 'safe', football-free shows that Mme. Giroud had pre-recorded for him. She censored newspapers and magazines – even going so far as to cut out pictures of Ronaldo in his underwear, which she kept in the drawer by her bed. She painted the street-facing windows black and nailed them permanently shut, and when neighbourhood boys struck up impromptu games of footie in a nearby park, she chased them away in her night-clothes, screaming like a banshee. OK. I made some of those last bits up. But Giroud did have an older brother who played football. Very well, actually. That much is true. One day Giroud Parcival sees three footballers knights on TV in the woods. Having never seen floodlights chain-mail before, he thinks that the stadium their shiny armour is heaven their skin, and that they must therefore be angels. That's it. He's wants to be an angel too. So he leaves home – breaking his mother's heart in the process – and heads off to join Arsenal Camelot. On the way, Parcival kills RVP the Red Knight – one of Arséne Wenger's King Arthur's worst enemies – and dons the fallen knight's golden boot red armour. The significance of his red armour is not lost on King Arthur, and Parcival is welcomed to Camelot. Laurent Koscielny Sir Gornemont takes Parcival under his wing, and teaches him essential knight stuff like driving on the wrong side of the road combat and flirting in English chivalry. Gornemont also implores Parcival not to talk so much. A good footballer knight should be seen and not heard, after all. At Arsenal Camelot, Giroud Parcival – along with fellow knights Cazorla Sir Lancelot, Vermaelen Sir Galahad, Gervinho Sir Gawain and the rest of the gang – spends his time doing knightly stuff like ridiculing Spurs rescuing damsels in distress, beating United 8-2 at Old Trafford slaying dragons, and winning silverware going on noble quests. But the single most important quest of all is winning the Champions League Cup the search for the Holy Grail. Hopefully I've made my point: the story of Parcival is practically word-for-word the story of our hunky French striker! It's like History repeating itself! History repeating itself! But here's the really good part: In the King Arthur legend – Sir Parcival is the Knight who finally finds the Grail. In fact – he not only finds it – but he becomes the Grail King. It's his destiny. His birthright. And now he's playing for Arsenal! Auspicious sign indeed – and made even more auspicious by the drawing of the Knight Of Cups. So if you've got this far – I apologize. To make it up to you, tomorrow I will go through the entire Harry Potter Septrilogy and reveal how Harry Potter is actually Arséne Wenger. And as an added bonus – I'll prove that Robin van Per$ie is Voldemort. (As if you didn't know that already). New post: “Arsenal and the Holy Grail”invinciblog.com/?p=387Please R&RT&Enjoy! Thanks. Standup commentary brought to you by @harlowgooner! BTW, my favourite knight is Don Quixote: ‘And so, to sum it all up, I perceive everything I say as absolute truth, and deficient in nothing whatever, and paint it all in my mind exactly as I want it to be’.